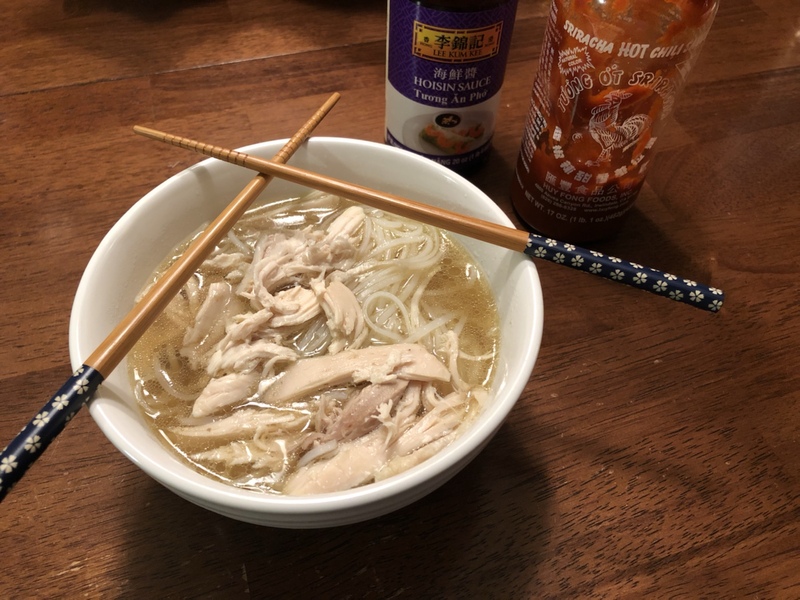 Instant Pot Recipes: Pho Ga (Vietnamese Chicken Noodle Soup) – Wichita By E.B. Pho in an instant Pot is something we’ve been wanting to try for a long time. For our first go around, we wanted to keep it simple and choose a Pho Ga recipe. It’s basically a Vietnamese chicken noodle soup. While Pho Ga isn’t something we ever order at a restaurant, the recipe we found was simple enough for our first attempt. I’ve pinned the recipe to our Pinterest page. 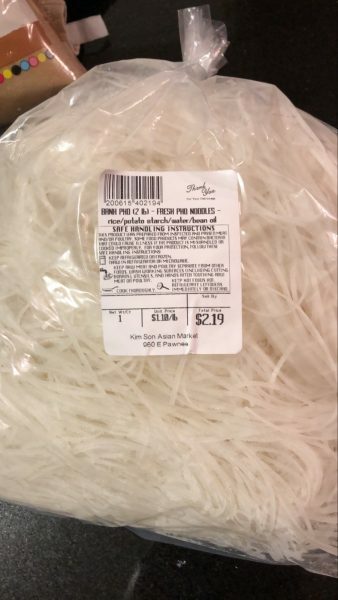 We purchased fresh pho noodles from a local Asian market for a couple dollars. Place 1 tbsp (5g) coriander seeds, half a cinnamon stick, and 4 cloves in the pressure cooker. Heat up your pressure cooker over medium heat (Instant Pot: press Saute button). When you smell the fragrance released from the spices (~2mins), remove and set aside the toasted spices. Make sure your pot is as hot as it can be over medium heat (Instant Pot: wait until the indicator says HOT). Pour in 2 tbsp (30ml) vegetable oil and ensure to coat the oil over whole bottom of the pot. Carefully place 2 halved medium onions (flat side down) and the ginger pieces in the pressure cooker. Allow the onions and ginger to char without touching them (~5 mins). At the four minutes mark, add in the crushed garlic clove. Pour in ½ cup (125ml) cold water and fully deglaze the bottom of the pot with a wooden spoon. Add in the toasted spices, 15g yellow rock sugar, 1 (36g) small bunch fresh cilantro, 2 tbsp (30ml) fish sauce, ½ tsp fine table salt. Pour in 3½ cups (875ml) cold water. Carefully add in the whole chicken with a kitchen tong. If your chicken comes with neck and feet, add them in as well. Pour in 4 cups (1L) of cold water. After 20 minutes, turn the venting knob to venting position to release the remaining pressure. Open the lid carefully. Serve and garnish as you’d like. This was a fairly easy recipe to make and much quicker than the real authentic route I was raised on. But we are now in an era of trying to save time and this cuts the process down to hour and 25 minutes. Once it was complete, our initial reaction was that it could use more salt. 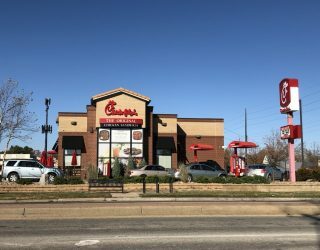 The broth was a little on the bland side and a slightly greasy from the chicken. While it wasn’t the best pho we’ve had, it was convenient to have at home. We’ve been talking about making pressure cooker pho forever (or pho-ever) so we were glad to finally do it. Pho Ga isn’t our usual preference when it comes to this popular Vietnamese soup so the next time we go the Instant Pot route, we will try the beef route. One things for sure, we will always use fresh pho noodles. If you have a great pressure cooker pho recipe, feel free to post it in the comments! Have a great Instant Pot recipe to share? Please e-mail us as we are always open to suggestions.